Other than the Harry Potter series, I’ve never paid any attention to when or how a new book was released. As a matter of fact, I don’t think I realized that books outside the Harry Potter series even had release dates. And until I struck up an online friendship with Aidan Donnelley Rowley last fall (which was recently and deliciously consummated in person over white wine and guacamole) I knew not a thing about the process of publishing a book. Now, several months, blog posts, and e-mails later my knowledge has grown from just North of nothing to just South of something. On her blog, Ivy League Insecurities, Aidan has generously taken us along for the ride as she journeyed toward publication. And on May 18th her book was born. I felt awkward pestering the staff at Border’s to unbox this new release a mere two hours after they opened on May 18th. And I felt awkward blabbering on about how the author is a friend of mine and I wanted to make sure her new title was properly displayed. But no amount of clumsy conversation could have stopped me from completing my literary mission of the day. I plowed through Life After Yes in about a week, gobbling it up in small chunks during IEP’s naps, before bed, and one last push to the end over lunch yesterday. After months and months of anticipation I had developed some sense of what LAY’s pages might hold, but for the most part my list of expectations was short. 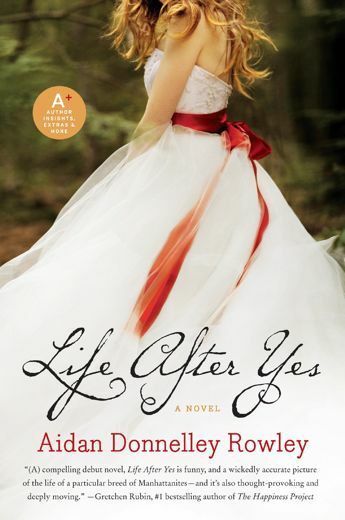 Life After Yes tells the story of young Manhattan attorney Quinn, affianced but afflicted about whether or not her life can withstand the structure of marriage. Hers are the problems of privilege, but no less real or distressing to Quinn because of it. Rattled after losing her father on September 11th she lives her life on the third rail, full of destructive habits that she’s forced to confront as she considers bringing another person into her life for good. I was happy to discover within the first few pages that the strong narrative voice I’ve grown to love on Aidan’s blog comes through clearly in her fiction writing as well. She works clever metaphors into tiny places, and her hallmark affection for alliteration (and assonance?) is subtle but ever-present. In addition to quick and flitting nature of her writing, the plot had much to offer as well. It was the glimpse into experiences I never had myself that brought me the most enjoyment from this book. I have long understood at an academic level that for many brides the foray into marriage is fraught with fear. But my own experience was quite different. In a long-term, steady, and decidedly non-dramatic relationship, GAP’s and my decision to marry was a slow one. By the time we finally married the fear had subsided, the questions had been answered, and we were confident about our path together. So walking in Quinn’s shoes for 340 pages gave me insight into an experience about which I’d previously known very little. Her story may be fiction, but her story is also true. Quinn’s losses became mine. Her fears became mine. Her mistakes caused me to feel shame and her success caused me to feel pride. Aidan lifts the outer layers of external perfection from her heroine and carefully reveals a creature who is initially less – but ultimately more – enviable than you thought she was based on her exterior. If the novel deserves any criticism at all it would be that it left me wanting more. Aidan’s deft descriptions paint rich and colorful pictures. In several scenes I wished for longer, uninterrupted passages that would allow me to really soak up the settings before commencing with the next plot point. The narrative didn’t feel rushed, necessarily, but there is an eagerness to it that in some ways augments the agitation Quinn feels, but also occasionally left me needing to pause for a breath. I hope that in her sophomore effort (which I understand is in the works!) Aidan takes her time and allows the characters and readers just a bit more space to get settled in before being ushered through the story. I’ve recommended Life After Yes to several friends and colleagues already. And this weekend I’ll be giving away my extra copy to a dear friend for whom the characters of Quinn and Avery will hold special significance. It was a treat to read this book; to flip through its pages feeling a special connection to the woman in the story via the woman behind the story. It’s not many of us who can count published authors among our friends. I’m happy to be in the minority. This entry was posted on Friday, May 28th, 2010 at 5:00 am	and is filed under Reading. You can follow any responses to this entry through the RSS 2.0 feed. Both comments and pings are currently closed. Great review, Gale. I purchased LAY recently, and am about half-way through. I’m especially loving Aidan’s descriptions…NYC just leaps off the page. Makes me want to finally break down and go there! Anyway, I’m traveling this weekend and am looking forward to time on an airplane so I can finish it. Congrats to Aidan, and thanks for this review! Oh, I’m so jealous you got to meet Aidan in person – especially over white wine and guacamole!! My copy of LAY just arrived yesterday from Amazon. I was practically giddy to see it in the mail, perfect timing as we head into a long weekend. (And perfect timing so I can participate in the Motherese book club.) Thanks for this review and whetting my appetite just a bit more. I can’t wait to go to bed early tonight and dive in! I am so excited about LAY. I devoured it when I got my hands on a copy.